Actress Emma Watson caught the internet’s attention last month when she showed up to the Met Gala wearing a dress made from recycled plastic bottles. Earlier this year, H&M partnered with hip-hop artist M.I.A., asking people to donate their old clothes to them so they could recover the material for recycled clothing. And Levi and the startup company Evrnu recently announced they’d found a way to turn recycled T-shirts into a jeans. It’s all part of a growing awareness, and demand, for recycled clothing. As consumers call for more sustainable products, companies are experimenting with ways to meet that demand while maintaining their bottom lines. That’s not an easy task, especially in the United States. “Part of the difference between Europe and the U.S. is that Europeans often value high-quality clothing,” said Jana Hawley, the director of the University of Arizona’s School of Family and Consumer Sciences, who has studied the textile industry for nearly 20 years and sits on the board of the Council for Textile Recycling. The Environmental Protection Agency estimates that, in terms of carbon emissions, the amount of clothing already recycled each year is equivalent to taking one million cars off the road. But Americans still throw away 13 million tons of textiles — about 85 percent of their clothes — each year, accounting for 9 percent of total non-recycled waste. Hawley said retraining consumers to buy fewer, better-quality clothes at a higher prices would mark a major step toward reducing that waste. But many companies are already looking to the next step — creating a circular system by using almost entirely recycled materials to create new clothes. The barriers to making this a reality are steep. On the business side, retailers have to find ways to motivate customers to bring clothing back to the stores when they are done with them. Some companies, like H&M, have experimented with giving customers a discount on their next purchase in hopes of both incentivizing them to return their old materials and buy new ones. Polyester is a relatively easy material to recycle. Because it’s oil based, it can be melted down and reformed into new fibers. Cotton is a different story. When broken down, it doesn’t retain the same strength as the original fiber. Complicating the picture is that most clothes are made from multiple kinds of fibers. Take jeans as an example. They used to be 100 percent cotton. 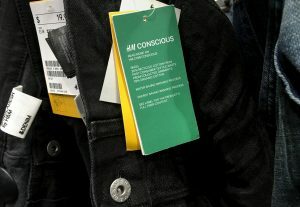 Look at the labels today, and you might see 84 percent cotton, 14 percent polyester and 2 percent spandex. Clothing manufacturers need those thin fibers separated to make new clothes — which is where companies like Evrnu come in. The Seattle-based startup’s mission is to take recycled clothing and turn it into an entirely reusable fiber. It’s working to break materials down to the molecular level, separate them out and regenerate fiber that is just as strong as the original. These kinds of innovations are attractive to retailers, which don’t typically invest in new technology. “There’s a really interesting synergy between startups working with larger companies,” Evrnu founder Stacy Flynn said. In the case of the Levi jean prototype, Evrnu took less than 90 days to create the fiber, yarn and fabric — showcasing how nimble startups can push boundaries more quickly than big brands. “This is new in this space, and we’ve seen some really positive traction,” Flynn said. But recycled clothing on a large scale is still a ways off. Levi and Evrnu don’t have a timeline for when their recycled jeans might be on the shelves. That’s why Hawley said customers need to find ways to use the recycling system that’s already in place. Instead, Hawley said, give your stained shirt to Goodwill or another nonprofit. If they decide it’s not good enough to sell in their retail stores, they’ll sell it to recyclers who sort it and use it for products like car carpeting or home insulation. So will there ever be a day when we regularly shop at stores with 100 percent recycled clothing? Hawley doesn’t see that happening. But she said by embracing all methods of recycling, there is plenty of potential for a more sustainable clothing industry — both now and in the future.